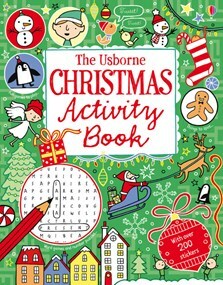 A fantastically festive write-in activity book, packed with puzzles, codes to crack, games to play, doodles to draw, stickers to stick and lots, lots more. Activities include helping Santa fill his sack with presents, decorating a Christmas tree, making snowflake decorations, and an advent calendar to colour in day-by-day. Includes Christmas traditions from around the world, from German Christmas market scenes to Caribbean Christmas recipes. A wonderful gift sure to provide hours of fun over the Christmas holidays. A bumper book of activities, perfect for building up excitement for Christmas and for giving busy mums and dads peace and quiet to get on with their preparations! I am amazed by just how much is crammed into this book - many pages have three or four activities, so it really is excellent value for money.